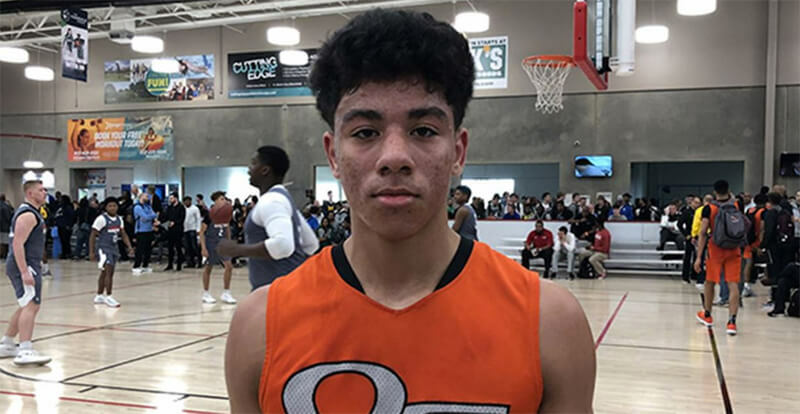 Class of 2019 Bettendorf (Iowa) point guard DJ Carton is narrowing the focus in his recruitment. The highly coveted point guard announced his top six schools late Thursday night via his Twitter account. The top six schools for Carton are Indiana, Iowa, Marquette, Michigan, Ohio State and Xavier. Carton is currently ranked No. 33 nationally in the 247Composite and is considered the fourth best point guard nationally in the class of 2019. The 6-foot-1 point guard made a campus visit to Bloomington last winter for IU’s game against Purdue. Carton plays AAU for Quad City Elite, which is not affiliated with a shoe company. However, that didn’t stop schools from tracking him closely in the two April evaluation periods. The Indiana coaching staff had a strong presence in Carton’s games in April in Dallas (Lone Star Invitational) and Minneapolis (Spring Extravaganza). Carton is currently among Indiana’s top five targets in Inside the Hall’s recently released class of 2019 recruiting board. Michigan is currently the leader for Carton in the 247Sports Crystal Ball. Coaches are looking at some top tier targets, land 3 of them and we’ll keep cooking. Hope he chooses us. I would 100 percent say this guy should be as high of a priority as TJD and KB. I think getting carton and one of hose two would be perfect. If they get a 3rd or even 4th with 2 forwards (brooks , watford, etc….) that’s icing on top. I know Archie says he doesn’t always need to fill every spot. I’m kind of surprised Wisconsin didn’t make his short list. I thought I read that he’s been attending UW’s summer basketball camp for the last couple of years. Some national recruiting analyst said we have some inside track with this kid. He seemed to be an early commit, probably before season starts. If he does come to IU, I wonder what our priority looks like for the rest of the class? Probably realized Greg Gruad isn’t going to last 2 more years. Wisconsin seems to be — I emphasize, SEEMS to be — in a free fall. Greg Gard is no doubt an excellent Xs and Os guy, but recruiting has not gone well for him. Granted, even Bo did not typically get elite recruits, but my sense is that things have gone downhill. Wisconsin (the state) has three players ranked in the top 100 for 2018, and all three are going elsewhere. Indeed, as far as Wisconsin kids go, Marquette now seems to be a more desirable destination than Wisconsin. Alex posted a list of the B1G’s recruiting classes for next year, and I think Wisconsin was second to last. Maybe Gard will find some traction in years to come, or maybe the players he is getting will turn out better than expected, but on paper things don’t look promising. Who is the lead assistent on this kid??? If he doesn’t choose IU I hope he picks Marq or Xavier. Do not want to face him in the B1G. Keep Indiana in these top recruits mouths. Don’t you love the deep intellect that recruiting season inspires? LOL. I’ll be surprised if he picks MU or Xavier. I heard we have inside track with this kid, but OSU seems to be the dark horse here. And can’t ignore his home state either. I’m disappointed Tyler Herro decommitted from UW. Not necessarily because he went to UK, but his home school desperately needs him and I think Gard is a good coach. But coach Cal knows how to recruit committed 5-star players, does he? I’m hearing Michigan has a clear lead. Would love it if you are correct. We’ll have Green, Durham, Phinisee at full time guard position in 2019. Hunter and Anderson seem to be able to play big guard and handle some ball too. Not saying we don’t need more guards, but with Morgan, Fitzner and McRobert graduating, I think our priority should still be on KBJ and TW (we agree that TJD should be #1 priority). I think this kid is special, but I’d prefer a 6’4 or 6’5 combo guard that gives some strong perimeter defense with some length. But I’d still be thrilled if he wants to come, for sure. I could be wrong but I thought Brian Snow, a national recruiting analyst, gave some edge to us. This is too early to make sense from crystal ball picks. IU is in such a luxury. Snow once practically guaranteed Wilkes was coming to IU when I thought there was zero chance. I know everyone is wrong sometimes, but I was amazed he actually thought that when I think Kris never really considered us at all. Wikes was down to us and UCLA days before commitment. I’m surprised you thought there was zero chance. Crean was real close on this deal. What is the source for that? I don’t think he ever planned to go to IU. Wilkes cancelled his final 2 OV after Indiana, and sources close to the situation indicated Indiana was strong lean. He named final 3 (UCLA, Illini, and Indiana) shortly after, and came back to IU for another visit (attended IU basketball practice on Saturday, and watched football game against Neb on Sunday, with several IUBB players). He called Crean personally before committing to UCLA. All these were indications that he seriously considered coming to IU, and we were likely the favorite at some point. I don’t know why or when he changed mind. You can google all this information. If you followed the whole recruiting process, it was all over the place 2 years ago. It was that football game when I knew he was never going to IU. I’m a really good reader of body language and he seemed extremely distant from everyone else, who seemed really together. If you put Green, Phinisee, Durham and Anderson(who played SG a lot in high school) as the returning guards assuming Romeo is one and done we definitely need one more guard in the next recruiting cycle. I don’t think four guards is enough for the roster. Agree it should be a combo guard along with Jackson-Davis. If we have another scholarship available then get either Watford or Brooks. I can’t wait for the recruits to visit during Hoosier Hysteria! SSAH is going to be a MADHOUSE!! This is all quite right, and what I can add is that right up until the end he was actively tweeting at IU fans. Don’t remember the exact words anymore, but Alex or someone I follow retweeted at least one tweet that was (as I recall, anyway) pretty clearly meant to excite the IU faithful. Maybe he was playing us all the whole time, but it’s hard to believe he would have spent months trolling IU fans just to amuse himself. I know everyone will give it up to Coach for landing such a great class (and rightfully so) but I hope the fans give special props to the Assistants, especially Schilling, for really bringing it home. Archie has surrounded himself with a GREAT support staff and they are really hitting their stride, especially on the recruiting trail. Hope we can keep them all together for a (LONG) while! That is quite a list of great programs. I hope he comes to IU and it is very possible he will be a five star based on the video of him.